I LAUGH in the face of pollen. Ha Ha Ha Hachoo! There’s an ugly rumour going around that I have allergies. Pshaw, I say. Poppycock. Rubbish! Slander, even!! Ok, I used to have allergies. I used to be terribly allergic to dogs growing up. And yet…my entire childhood, we always had a dog, and I’m glad we did. Not just any dog, either, but for the majority of my childhood we had a Great Pyrenees. Think German Shepherd size, maybe a little bigger. Think HAIRY. SUPER SUPER HAIRY. (Or just check the official AKC page I linked to right there. That’s what he looked like.) I just had to learn what I could and could not do; i.e. for the most part I had to avoid getting too up close and personal (think big puppy dog hugs, those were out), as well as small enclosed environment, such as car rides with the windows all rolled up. However, as I grew older, my allergies become less and less pronounced, until finally, they were mostly an afterthought, especially after I quit smoking. So a few years back (pre-quitting smoking), I had this allergy test thing done. I was having some issues with the dog I was living with at the time, so I wanted to rule out other stuff. The result came back: HIGHLY ALLERGIC to Dogs, Cats and Grass. Riiiiight. Whatevs, Mr. Allergy Dude. Because the whole time I had dog allergies growing up and lived with the dog, I also lived with at least two cats. And I most certainly came in close proximity to them, often. (Much to their endless chagrin, I’m sure.) And I lived across the street from a pretty large park. And then, we moved to New Hampshire, which is at least 98.3% grass. And now? I will occasionally have an evening where I can feel the scratchy throat, but other than that, nothing. I have my own dog, and live with two others, I have a cat, I mow my lawn. And seasonal allergies? I always felt bad for the poor chaps who were afflicted every spring, but not me. I always welcomed spring with open arms and nasal passages. Until now. The past 36 hours or so have been pure misery. So clearly there must be some fluke, right? Some strange occurrence that makes this pollen season different, or worse, or …freaky? Well. I have a theory, you see. Check out my post on ourpdx.net for my brilliant conclusion. Theories aside, however…I’m getting cozy with a little thing called Loratadine, aka Claritin. Which, I’ve found out since my little outburst on twitter last night, takes a few days to kick in. 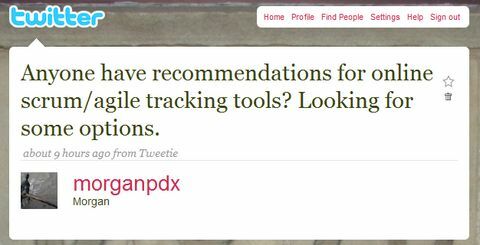 I’ve also seen it do amazing things, like give me and everyone in Portland instant information about the weather. Or hearing about an earthquake that happened, seconds after it happened. I hear things on the news days after I hear about it through my Twitter network. It’s amazing. Networking, keeping in touch with friends, keeping my finger on the pulse of the tech community of Portland – all through Twitter. I’ve also seen friends and aquaintances of mine ask questions of their tweeple (twitter+people) and have a truly amazing level of feedback, instantly. Instantly. Can you say that about forums? Or, ha, customer service? However, it’s not something that has ever happened to me. I’m currently helping the ORBlogs effort become an agile project. I’m also going back to IT at work (joy!) and have been approached about being a technical lead on a project at work. Being, as I am, an agile-vangelist, I thought it would be truly great if I could find a web-based agile tracking application that would help me with both of those efforts. So…I figured, I’d hit up my Twitterverse, see if they know anything. I mean, what the heck do I have 170+ people following me for if I can’t ping ’em for info now and again, right? I figured my pal and former coworker/teammate Jason (@slimstarman) would probably have some feedback about it, but I wasn’t sure if anyone else in my little network would have any ideas. And there was more. That’s just the first major clump. Wow. I mean, wow. Witness, the power of Twitter. I mean, all those responses, within a minute of my question. A MINUTE. Instant, relevant, helpful, information. Thanks to @hamids, @evacatherder, @mcottmeyer, @slimstarman (Ha! See, I knew he’d have an opinon), @donpdonp, @gerrykirk, @rickwindham, @rockcogley, and @silvercatalyst for all the great feedback on my humble little question. I ended up liking the Pivotal Tracker (@pivotaltracker! They’re on twitter too!) and am giving it a test drive. So to commemorate my first-hand exposure to the Power of Twitter, I will be wearing my new ThinkGeek shirt tonight at Ignite Portland 5!!! It’s got Twitter written all over it. If you’re in Portland tonight around 6pm, just go. You’ll see. It’s free, and it’s awesome. But get there early!